Auditory Attention Word List. This auditory bombardment word list is designed for use as a focused listening exercise at the beginning and end of therapy sessions. Prop Box. A list of props is included for each story. Children can use the props when retelling or acting out the story. Art Activity. Reproducible patterns are used in the art activity. The art projects provide "hands-on" experiences that appeal to young children. Activity Suggestions. Activities are suggested related to the content of the story and to the experiences of the student. Many of these activities can be completed either in the classroom or at home. 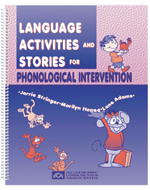 The activities in this book can be used to improve speech intelligibility and to help children expand verbal responses from single words to complete sentences. Regular Price: $34.00. Special Offer. Save money NOW!